Today on Facebook I made reference to the fact that today is the 61st anniversary of the release of the Disney Cartoon “Trailer Horn”. In this cartoon, Chip & Dale awaken to find that Donald Duck is camping in their neck of the woods, so of course the guys gear up to wreak havoc on Donald, his camping gear, and most importantly — his car! If you want to take a look at the video, here it is below! Enjoy! I found out the other day that Blogger has been working hard at adding options to the popular blogging platform, and thought you all might like to see some of the work that they have done. This is more of an informational session for those that are geeky like me, but I hope you will take a look at the different links to decide which one you like best! Mobile Format. For those of you with smartphones, or handheld devices, I have turned on mobile page support for my blog. Now you can even get your My Dreams of Disney fix while you are out on the go! Check it out at http://www.mydreamsofdisney.com/?m=1. Each view has it’s own unique characteristics, so I invite you to take a look at them to determine which view you like best. One thing I’m not entirely sold on is that in the different views, my special layout looks are gone, and the pages are pretty generic. However, the flip side of this is that there are some neat features that I do like about each of them, so while I won’t utilize them exclusively, there are times when I would be interested to see how they look. Interestingly, I’ve just tried out the views on my small iPod Touch, and it looks like the only one you get when you go to the site views page is Mosaic. So tell me, take a look at the pages and tell me which ones you like the best! Thanks for reading! I’ll bet you thought I was never going to write this last installment on my “Sites and Sounds” series, did you?! Well, after a couple of week hiatus, I am back writing about my sites and sounds — this time we are going to look at Disney’s Hollywood Studios. If you remember, last time we looked at my favorite sites and sounds at Animal Kingdom. Part of the reason that I was having trouble writing this segment is because when I think of things that are more about sites and sounds, I really don’t think about Hollywood Studios. To me, Hollywood Studios is about the action, the adrenaline, the thrilling rides. However, I’ve thought about it for a while, and I’ve got my list of my favorite sites and sounds. A few years ago we went to this show to see how various characters were drawn. The host was a Disney animator, who worked with Mushu from the movie Mulan to help show how characters are drawn. One of the things that we like to do is to enjoy the street performances that we can see just while walking on the streets of the park. Last time we were there, we even had an impromptu visit with Alberto Dante! I had heard that he was no longer at Hollywood Studios, so I hope this isn’t the case. Another thing that we enjoy doing is watching the various shows that you can see from the Sorcerer Mickey Hat. We’ve seen a couple of different dance numbers, and although they are sometimes cheesy, for the most part Sophie likes watching them, and we enjoy the break also. 2) People watching on Hollywood Blvd. When Sophie and Cindy are off riding the Hollywood Tower of Terror, one of the things I like to do is just sit on a bench on Hollywood Blvd., and look at the people walking by. As they walk by, I wonder about how many are there with family, how many are there with their friends and spouses, and how many are there by themselves. It’s always fascinating to me to watch the other Guests and see what I can determine about them just by looking. At the top of my list, of course, is the Rock ‘n’ Roller Coaster. This attraction has it all, of course, but for this post, I’m going to focus on all of that awesome music! The music makes this ride — it sets the stage in the pre-ride dialogue before you board the stretch limo, it has as much of an impact on the actual ride as any other ride in the parks, and it does as much for the adrenaline rush you experience as all the twists and turns do. The music of the Rock ‘n’ Roller Coaster is just incredible. One attraction that you may find surprising because it isn’t on my list is Fantasmic. The reason for this is simple — I’ve never seen it. There are several reasons for this. I’m not sure if we will see it this year or not, I’m going to leave it up to other people to see if they want to see it also. Basically, though, the reasons we haven’t seen it are because 1) They don’t have it every night — so you’ve got to plan your day accordingly to see it, 2) Sophie and I are both sensitive to loud sounds and bright flashes, and I was worried that this would disturb Sophie, and 3) I’m not sure, but I wonder if it would be a little scary. If any of you would please comment about my phobia towards Fantasmic, I would greatly appreciate it! Tell me whether I am right or not. Thanks! Today on Facebook I mentioned that today’s Day in Disney History is about the release of “Wild Waves” in 1929. If you are interested in seeing the video, here it is! Enjoy! As all of you know, My Dreams of Disney is our blog commemorating all of the things that we love about Walt Disney World. We have had quite a run of it since we first started our blog back in September, but none of it means a hill of beans when you compare it to what our lives would be like if we didn’t know Jesus, our Lord and Savior. 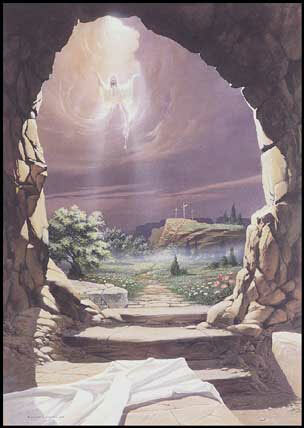 So tonight, on the night before we celebrate the Resurrection of Jesus, I wanted to take a moment to wish all of you a glorious Easter Sunday. I hope that you are all able to worship Jesus and thank Him for what He has done for you, no matter where you live.